Delight the avian visitors to your yard with the Heartwood Jubilee Bird House. Crafted to mimic a country church, this roost will certainly add a touch of joy to any yard. The antique white body and steeple create a familiar silhouette, and the bright red, gothic style door adds fun color. A filigreed metal medallion rests above the door, while the steeple is capped with copper for added design and attention. The 1.5" diameter entry hole sits between the medallion and door, for small songbirds to use the item. A steeply pitched roof with multi colored shingles furthers the theme while adding more color to the home, and a copper ridge on the roof lends a touch of style. The front panel of the home opens for seasonal cleaning or nest checks, and a hole in the center of the base allows any captured water to drain. Screening behind the filigree adornment helps regulate the temperature in the roost, so nestlings will not overheat. Add a mounting bracket to the base of this house to attach it to a post or pole, or use the hardware on the back to place it against a fence or wall. The cypress construction will withstand the elements, while maintaining the pastoral theme. 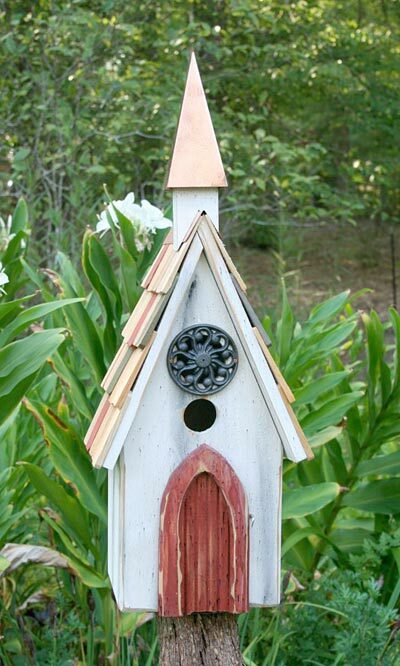 Bring a cheerful look to your yard using this Jubilee Bird House. Made in the USA.